Ann Whitley, primarily an old-time fiddler, is a regular participant of the Old-Time Jam session on Fridays at the Historic Vickery House on the University of North Georgia (UNG) Dahlonega Campus. Whitley is the curriculum director of the Georgia Pick and Bow Traditional Music School Inc., which preserves and promotes the traditional music of Appalachia by leading children to play and sing in the old-time and bluegrass traditions. Every Friday afternoon, sounds from banjos, fiddles and guitars resonate through the Historic Vickery House on the University of North Georgia (UNG) Dahlonega Campus. Upon closer listening, the sounds have the same foundation but are a little different. These instrumentalists are preserving the old-time music passed down from generation to generation and jamming to their favorite tunes with fellow admirers of the late 19th and early 20th century music. 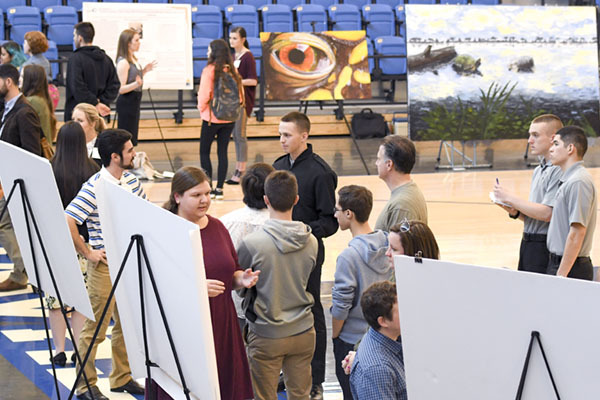 Educating students about southern Appalachia's art, history, music, and nature through community service learning, undergraduate research and creative activities is the mission of the Appalachian Studies Center. The center hosts the weekly jam and is headquartered in the Vickery House. 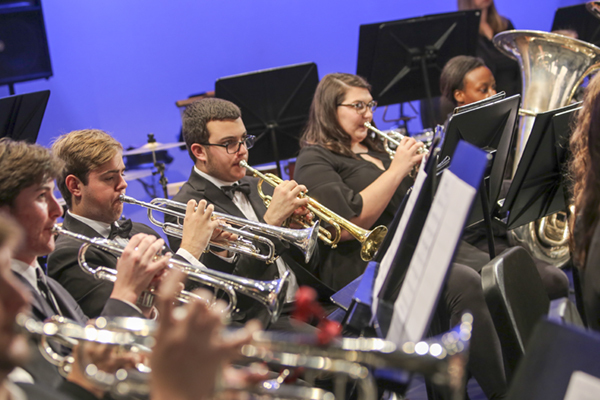 "Old-time music is reliant on passing down the tradition in order for it to persist in time," said Craig Wilson, an assistant professor of visual arts at UNG. "The musicians who play not only enjoy the love of playing the music but love the community and sharing." The weekly Old-Time Jam is from 11:45 a.m. to 1:45 p.m. every Friday. Anyone may come and listen or join the jam session no matter his or her skill level. One stipulation is only specific instruments are allowed, including the guitar, claw hammer banjo, upright bass, fiddle, dulcimer, mandolin, and ukulele. 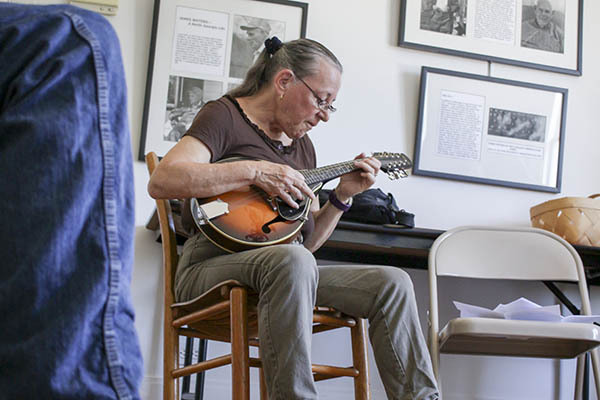 Pamela Deemer plays the mandolin during the Old-Time Jam session at the Historic Vickery House, which is the headquarters for the Appalachian Studies Center. "It is acoustic only or a culturally specific instrument," Wilson said. "No electric guitars." Wilson joined the group because he wanted to learn how to play a new instrument—the banjo. Jon Mehlferber, an associate professor of visual arts at UNG, invited him to join after seeing Wilson carrying a guitar on campus. "I was welcomed even though I wasn't very good," Wilson said. "They were very tolerant of my playing and encouraged me." The Old-Time Jam was founded in 2010 shortly after Mehlferber crossed paths with Ann Whitley at a national Appalachian studies conference. Whitley is the curriculum director of the Georgia Pick and Bow Traditional Music School Inc., which preserves and promotes the traditional music of Appalachia by leading children to play and sing in the old-time and bluegrass traditions. Whitley, primarily an old-time fiddler, and Mehlferber were playing in a primarily bluegrass jam near the Appalachian exhibits. "Jon Mehlferber sat down with an open back banjo, and he played claw-hammer style," Whitley said, explaining claw-hammer is a rhythmic and melodic style prevalent in old-time music. This impressed her. "And I said 'Who are you?'" The two decided to start a jam session for musicians who played old-time music. Now, the Old-Time Jam features musicians from as far away as Atlanta and Ellijay and is celebrating its seventh anniversary. As few as six players will meet Fridays, but that number can grow to as many as 20, Whitley said. "We all scrunch up together," Whitley said, waving a hand around the room on the back end of the Vickery House. "When it is a nice day, we play on the porch." Whitley explained old-time music sets itself apart from other genres because the musicians play together but may play the tune differently. 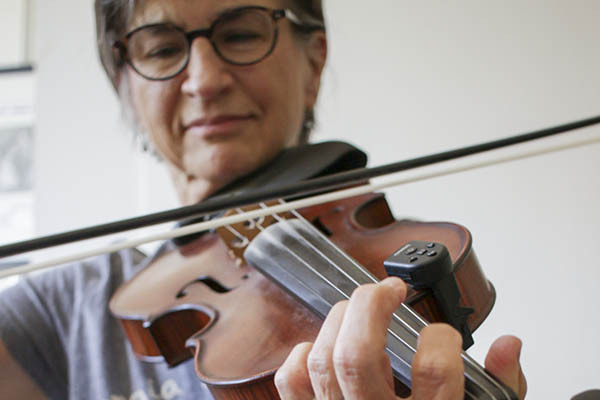 "The base tune is there, but the approach varies in different ways," she said. "For instance, you can play it on the high strings and then you can play it on the low strings." Mehlferber said old-time music was also played as an accompaniment for dancing, such as flatfooting or square dancing. "Old-time was not meant to be performed in front of an audience," he said. "You would get together with friends and play for the joy of playing." That is exactly what members of the Old-Time Jam do. Each musician gets something out of the experience. "It's like meditating while exploring whatever you want to do in that tune," Whitley said.